Have you started thinking about your holiday lighting and decorating yet? You may not have, but retailers are starting early hoping to get you thinking now about how you’ll deck your halls come December. It’s time to plan your Christmas light displays! The retail mega-combo Kmart and Sears today blasted thousand of American homes with its first animated e-mail of the season. Complete with a flying airplane banner boosting its Christmas Lane line and traditional bell-tinkling holiday music, the execs of these stores don’t want to miss a single early holiday sale–especially when little or no growth is to be expected. So what are they touting for the holidays this year? The highlight of the collection appears to be a Kmart exclusive grouping of collectibles and ornaments from the Lemax Village Collection. The collection includes a little something for everyone. Victorian homes, a scuba and boat salvage, a vintage lighthouse and even a nostalgic bowling alley round out the we’ve-got-it-all village. For those of us that covet ceramic Christmas villages but don’t have the money to make a huge investment, there’s Lemax. A cute little warming hut starts at $11.99 with plenty of selections in the $20-$40 range. If it’s movement you covet, check out the Ferris wheel, carousel or flight school. Each of these come with a 4.5 volt adapter and cost $65-$75. 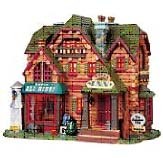 Pictured here is the Lemax village collection Inn and Ale House offered at $29.99. A simple attractive display can be assembled with a few of these village buildings placed on a bed of fiber-fill snow. For added interest run some miniature Christmas lights through and around your display. 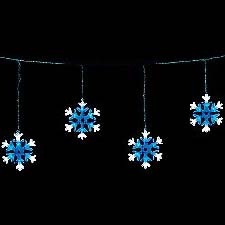 To check out the selection of villages see Kmarts website of holiday lights decorating http://www.kmart.com/shc/s/s_10151_10104_Gifts_Seasonal+Shop_Collectables. Whatever the holidays have in store for you Kmart and the nations holiday retailers are ready provide–preferably sooner than later.